Robert Motherwell (1915-1991), one of the leading American Abstract Expressionist painters, was also a theorist and exponent of the movement. His writing articulated the intent of the New York school —Jackson Pollock, Willem de Kooning, Adolph Gottlieb, Franz Kline, Arshile Gorky, and others—during a period when their work was often reviled for its departure from traditional representation. As founder of the Documents of Modern Art series (later renamed the Documents of Twentieth-Century Art), Motherwell gave modern artists a voice at a time when very few people understood their theories or work. This authoritative new edition of the artist's writings about art includes public lectures, essays, and interviews. 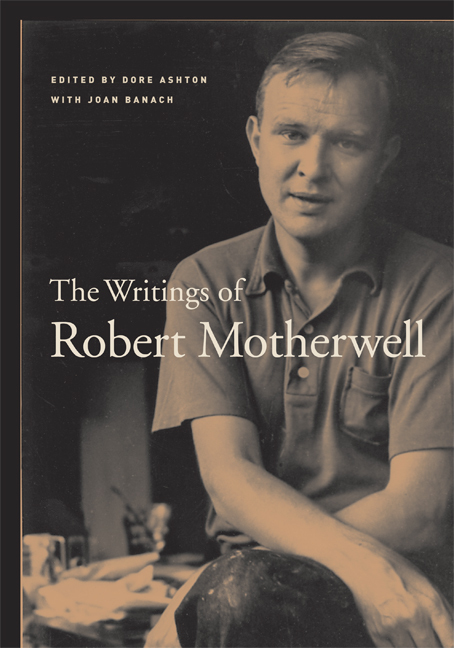 Impeccably edited, with an informative introductory essay and rigorous annotation, it is illustrated with black-and-white images that elucidate Motherwell's writings. Dore Ashton is Professor of Art History at the Cooper Union and author or editor of over 30 books on modern art and culture, including Noguchi East and West, The New York School: A Cultural Reckoning, A Fable of Modern Art, and A Critical Study of Philip Guston, all from UC Press. Joan Banach worked with Robert Motherwell from 1981 to 1991. She is an artist who lives in New York.